Lay two strips, staggering them so they lay flat and across the full width of the lower brood chamber, in the heart of the brood rearing zone, with approximately 2 inches between strips and 4 inches between the ends of the brood chamber and the outer edges of the strips. Follow the Application Options pictogram. 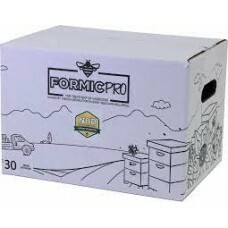 Add a honey super with frames at time of application if necessary to provide adequate space for strong colonies to expand, or if a honey flow is expected. It is acceptable to have queen excluders in place. Allow a minimum of one month between applications. Do not mix with other miticides. On Day+0: Lay one strip across the frames in the center of the lower brood chamber, in the heart of the brood rearing zone. Follow the Application Options pictogram. On Day+10: Remove and replace with a second single strip. The application of the second strip may be delayed if weather conditions at day +10 do not allow for treatment. The second strip must be applied as soon as weather conditions permit to complete treatment. Monitor your mite levels throughout the beekeeping season. Treat with Formic Pro when mite levels reach the threshold for your area. High mite infestations may require more than one treatment. Check the expiry date on your pail. FORMIC PRO has a 24-month expiration. Slow release technology begins to degrade when the product expires and could lead to excessive bee mortality. Always place treatment on bottom brood box. 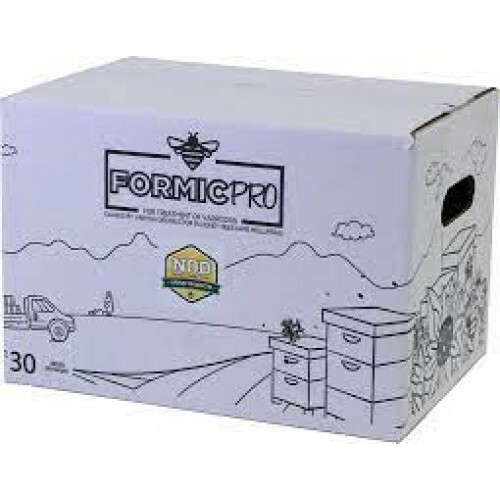 Formic Pro is a brood treatment and is most effective when placed in the heart of the hive. Optimal treatment temperatures for Formic Pro are between 50°-85°F. Store out of direct sunlight and in a dry location. Keep product in original container and tightly close lid. Store in a well-ventilated area, away from sulphuric acid, oxidizing agents, and sources of ignition. Remove entrance reducers. Bottom board entrances must be full width of the hive, minimum height ½ inch and fully open for entire treatment. If colonies have permanently reduced entrances, set back the upper brood box by ½ inch, or insert wedges between the bottom box and the bottom board to create a full entrance. *Close off screen bottom boards for maximum efficacy. Do not consider open screen bottom boards as ‘ventilation’; bees draw in air through the bottom entrance to ventilate the colony.